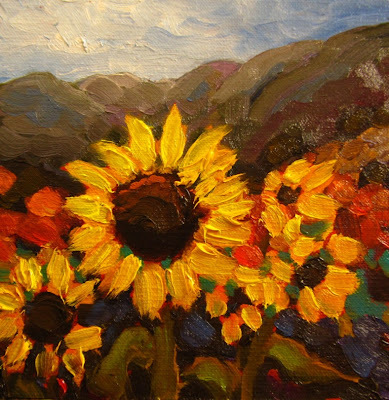 This is tonight's daily painting, a trio of sunflowers hidden in a canyon in the mountains. I have to admit, I LOVE these new Raymar premium primed linen panels. I love them so much that I have decided to use them for my 150 CHALLENGE show. So I'm ordering 8x8s and 8x10s tomorrow. Because of that, the 150 CHALLENGE won't start for a few more days. I'm kind of glad, I need to do a bit more organizing on my subject matter. I'm also debating whether I'm going strictly palette knife or using big flat brushes. If I use just the knife, the paintings are definitely going to have more of an abstract look. Hmmm, still thinking about it. Anyway, stay tuned and if you would like to purchase this trio of sunflowers, please click on the Paypal button below for more information. The first 150 CHALLENGE painting!